'Why can Google bring 20,000 jobs here without any public subsidies but Amazon needs $3 billion?' asked one state senator. Protesters gathered near the site where Amazon plans to build its New York City office complex to voice their concern on Wednesday over the multibillion-dollar incentives being awarded to their future neighbor — and the subsequent impact it will have on housing, rent and transportation. The warning is a reference to the helipad Amazon allegedly asked for — in addition to the $1.7 billion in performance-based tax incentives the retail giant procured from the state of New York. Amazon has also said it will apply for a subsidy program that would give property tax abatements for up to 25 years, along with other tax incentive programs for which it may be eligible. 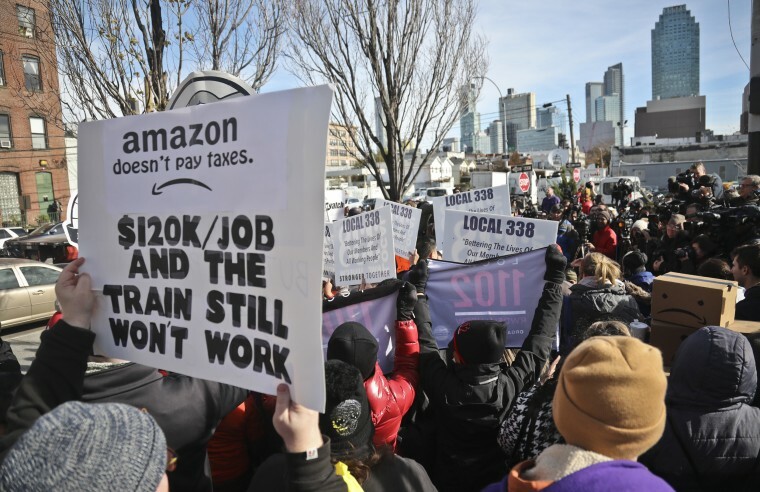 Protesters gathered Wednesday in Gordan Triangle near Amazon’s future headquarters listened to local politicians who said they weren’t given a seat at the table during negotiations and demanded transparency and a say before Amazon breaks ground in Long Island City. Congresswoman-elect Alexandria Ocasio-Cortez, whose district is in Queens, was at freshman orientation in Washington but sent a representative to the protest, who said Ocasio-Cortez opposes the current Amazon deal. For more than an hour, several local politicians and community activists spoke to a crowd holding signs and offering a chorus of boos every time the helipad and billions of dollars were mentioned. “We don’t even have heat and hot water in Queensbridge!” one protester shouted. The Queensbridge Houses are the country’s largest housing project and will be Amazon’s new neighbor. “I have no dog in this fight. I’ve never even ordered anything from Amazon,” Dillon said. Still, he said he believed New York Gov. Andrew Cuomo could have made a better deal. “They gave away the store. There’s no two ways about it,” he said. Amazon's decision to select Long Island City for one of its newest office complexes was only made public on Tuesday, but Gianaris said the fight is just beginning. “We are not giving up until we scuttle this deal, scrap it, throw it in the garbage and start the conversation again,” he said.